"Panpolo" is a popular breakfast item in Konkani household. 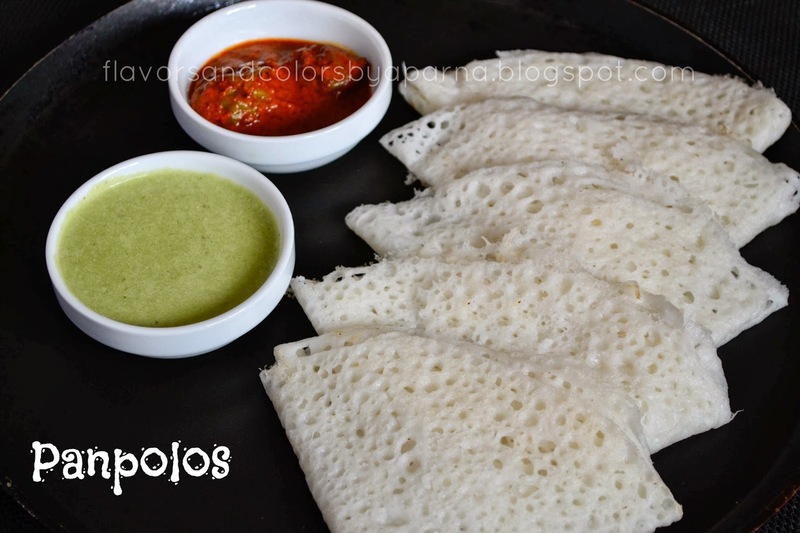 "Polo" is konkani word for dosa and "Pan" describes these dosas to be thin as leaf made from watery batter. 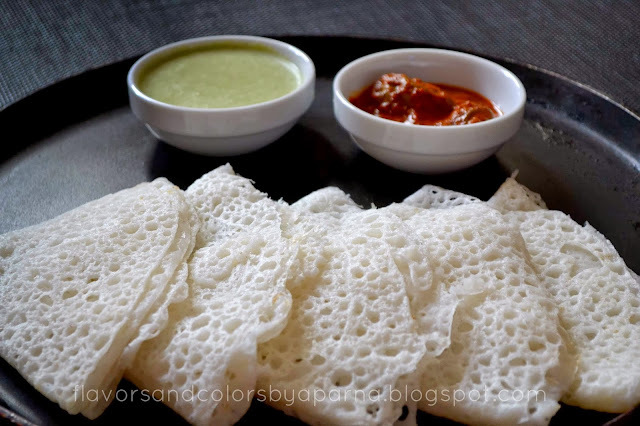 These dosas are thin, snowy white color, soft and lacy texture. Kannadigas and Tuluvers too prepare this dosa, called as "Neerdosa" where they grind the batter without any coconut which makes it crispier as compared to panpolos. Since making this dosa doesn't involve fermentation, I find it convenient to prepare them and moreover this is a family favourite so prepare it frequently [Actually this is my favourite from childhood days and used to be happy to see them on breakfast menu prepared by mom]. The secret to getting soft lacy dosas is to achieve correct watery consistency of the batter. You can see how the consistency is in the below pic. Besides that you need to master the technique of pouring the batter [I would call splashing on pan because that's how I learnt to do them from my SIL ;)] on hot iron griddle and be able to get lacy effect to these dosas. 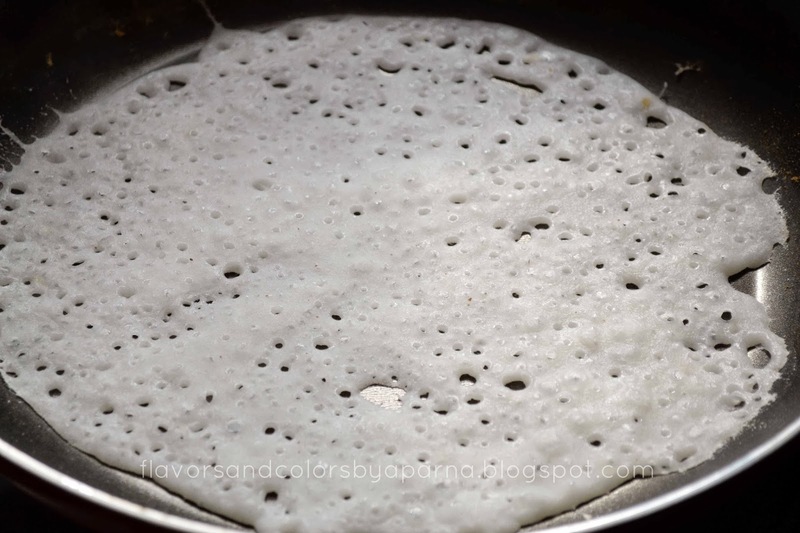 Traditionally they are prepared on iron griddle which needs to be well seasoned to get excellent results, if not the dosas would stick to it and difficult to fold. After some trial and error, you can see my successful results on non-stick pan/ griddle in the below pic. Wash, clean and soak dosa rice for 4 -6 hours. Drain the water. Grind the rice with coconut and little water to a very fine paste. You can use water of tender coconut too instead of plain water. Transfer the paste to a vessel and add enough water to make the batter of pouring consistency [as you see in one of the above pic]. Add salt to taste. Heat a non stick pan/griddle. When the griddle is sufficient hot, pour a laddle of batter and you will hear it sizzle. Now tilt the pan so it spreads evenly. I follow my SIL's technique of throwing the batter from little height over the pan to get holes/lacy effect in this dosa. Do not try to spread the batter with back of the laddle. Cover the pan with a lid. 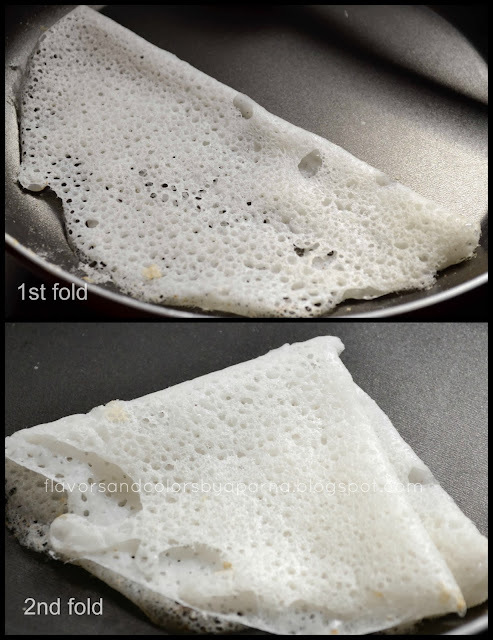 Cook the dosa on one side and fold it twice to triangular shape. Proceed to make dosas with the remaining batter till you finish it. Serve these dosas hot with accompaniment of your choice such as churnu, chutney or pickle. It goes well with sambhar and gravies too. Here I have served with mint pineapple chutney and store bought mango pickle. Clean and wash mint leaves as well as coriander leaves. Chop the green chillies. Peel the ginger and grate it. Place all the ingredients along with pineapple chunks in mixer or food processor. Blend all the ingredients to fine thick paste adding little water. Adjust salt and sugar to balance the taste. Transfer this to a serving bowl. I didn't temper the chutney this time due to lack of time. Additional step [optional] : Temper this chutney with mustard seeds, red chilly and asafoetida. 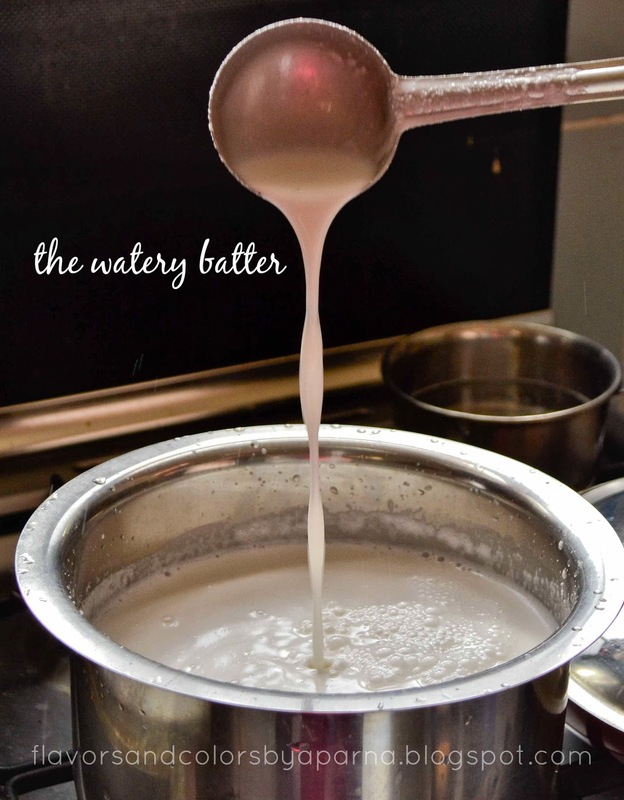 Note: You may need to stir the batter well from the base of the vessel every time before taking into the laddle. I keep adding little water in between as I proceed making dosas, so that the batter does not lose its watery consistency and the dosas come out well like thin crepes. Thanks Aparna for all these recipes. And very good technique of throwing of batter from little height on pan, i tried it today morning only and the result is fantastic. @Manisha Khistmatrao : what a surprise to see ur comment... thnks dear for your feedback about fantastic results ...hope Deepak enjoyed his breakfast !